With USB plug to fit various computers, can be widely used in many fields, such as video conference, distance education, Internet webcast, network singing, recording, games and so on. Can effectively reduce background noise, clear audio, 360 degree omni-directional recording, picking sounds range is about 2m, fit for small meetings of 4 to 6 people. With non-slip mat on the base, can be placed on the table stably, the length of cable is about 1.5m / 59inches. 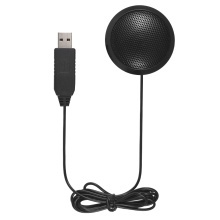 Easy to operate, plug and play, without any drive, just need to connect the microphone to your computer directly to use. All-metal material, very durable; diameter only 5.8cm / 2.3inches, small size and portable. There is a reasonable error in manual measurement. The computers showed in the pictures are not included.